“Somehow not only for Christmas, but all the long year through, the joy that you give to others is the joy that comes back to you. And the more you spend in blessing the poor, and lonely and sad, the more of your heart’s possessing returns to make you glad” – John Greenleaf Whittier. The Clearfield Borough Police Department and the Clearfield County Area Agency on Aging Inc. (CCAAA) partnered to create “Giving Trees” for area elderly and are again teaming up to spread some holiday cheer. Elderly citizens in the Clearfield area, many of them living alone with no close family members or no family at all, could benefit greatly from a small act of kindness. Last year, many individuals and organizations came together to provide truckloads of gifts and financial assistance for heating and medical needs. More than $9,500 was collected and sent directly to local fuel suppliers to ensure our frail and elderly were warm in their own homes last winter. 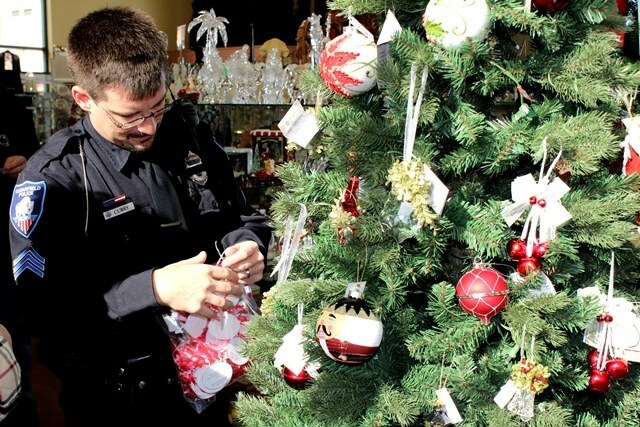 For 2018, the police pepartment and the Area Agency on Aging are partnering again with the Clearfield Pharmacy & Gift Shoppe and the CVS Pharmacy of Clearfield to host the trees. The employees of the local PennDOT and CBT Bank, a Division of Riverview Bank, will also have their own tree and collect internally. Tags will be hung Nov. 20, at both pharmacies. From Nov. 20 through Dec. 7, a giving tree will be available at the Clearfield Pharmacy and the Clearfield CVS. The giving tree will offer the needs of many senior citizens around the area. Individuals are welcome to take a card, purchase and wrap the needed items on the card, and drop off the items and the card at either the Clearfield Borough police station or the Clearfield County Area Agency on Aging Inc., both located on North Front Street, Clearfield. Both police and agency staff would like to encourage everyone to please help someone in need this holiday season. Again, this year a “Giving Tree Fund” will be at CBT Bank, a Division of Riverview Bank, will be available. Anyone wishing to donate to assist the elderly with utility costs (heating assistance, water bills, etc.) this holiday season can drop off a check made out to “Giving Tree Fund” at any CBT office (North Second Street or branches). The Clearfield County Area Agency on Aging and the Clearfield Borough Police Department would again like to say “thank you” in advance to the many community members who will so generously support the Giving Tree. They would also like to thank the Clearfield Pharmacy and the CVS of Clearfield for hosting the trees and to the employees of PennDOT and CBT Bank, a Division of Riverview Bank, for their support. “Many senior citizens are often forgot about during the holiday season. Let’s make sure they have a great holiday as well,” organizers say. “We were so overwhelmed by your kindness and look forward to this year.